This week people started off with Betrayal at House on the Hill, Citadels and Nexus Ops followed by Food Fight. 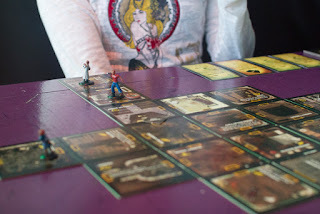 I think it was the first time Nexus Ops has been played at IpBoG but certainly not the first time for Citadels or Betrayal, although it's been a while since I've seen Betrayal come out. There was a time when it seemed to get played every week for a few months. I know in this case the haunt was some sort of evil twin scenario where there was no single betrayer. I guess either no one was the betrayer or everyone was. This week I played Tzolk'in for the first time. Although Alex had the expansion with him we played just the base game. Apparently the expansion is a bit fiddly for a fist timer. It's a medium-heavy game; worker placement, resource conversion, victory points - that kinda thing. But with big plastic wheels that rotate and move your workers into different positions that allow them to take different actions. The game is all about timing when you put your workers on and take them off, and making sure there is some sort of efficient engine going on. Half way through the game there is a big scoring turn. I had a single point but everyone else was in the 20's. Either I was biding my time and playing the long game or I had no idea what I was doing. Obviously I had no idea. But in the last couple of turns I managed to build a temple that scored me a bunch of points for my tech track. I don't remember where I came but it wasn't last. Probably one from last. Dan was the winner. He'd made good use of the god track and had a good lead in the start which just snowballed towards the end. 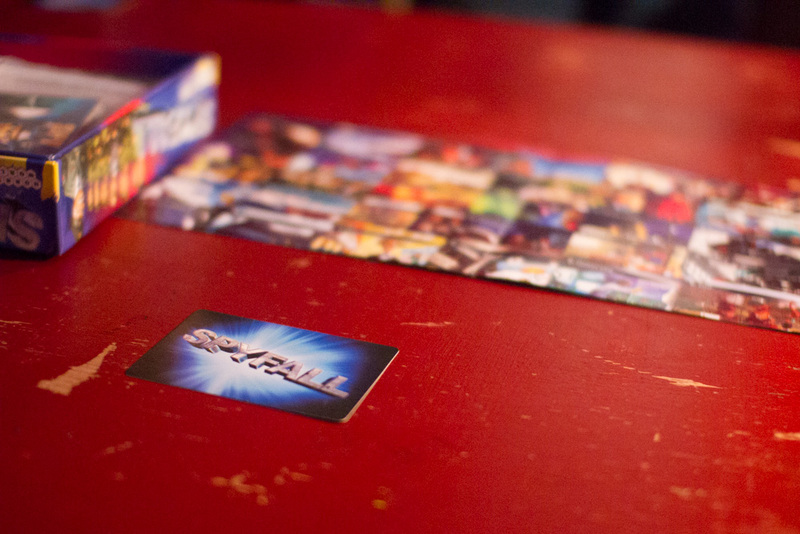 The big news of the night though was that Danny had obtained a copy of Spyfall. That's pretty impressive going as it's notoriously hard to get a hold of at the moment. Danny played a few games and said that it kinda fell flat with his group. I think maybe he made the mistake of playing with the roles straight away because I played it a bit later with a group of six and it went down incredibly well. After a couple of rounds we got into the swing of things and a few rounds later three of us were talking about buying the game for ourselves. That's a pretty good ratio. It's probably my favorite party/deduction game. For me this is everything The Resistance wants to be, although I'm sure hoards of pitchfork wielding people would disagree with me. We added the roles which changed up the game quite a bit, I'm not sure for the better or worse. Without the roles the game seems to be about trying to keep your questions and answers vague enough, whereas with the roles it almost seemed to be about asking and answering questions until the spy slipped up. The roles made things harder for the spy and drew out the game a little longer. It's nice to have the options of both though, to add a bit of variety but I wouldn't say the roles are the definitive way to play, which the rule book seems to imply. I've not been so impressed by a new game in a long time and it definitely deserves all the praise it's been receiving recently.